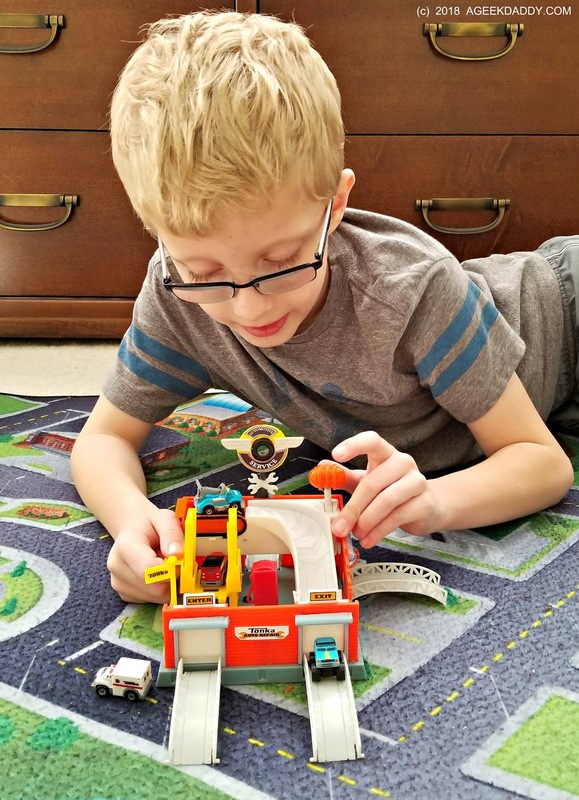 Funrise is letting a new generation of kids enjoy the iconic Tonka toy brand through a lineup of miniature construction, rescue, and utility vehicles. 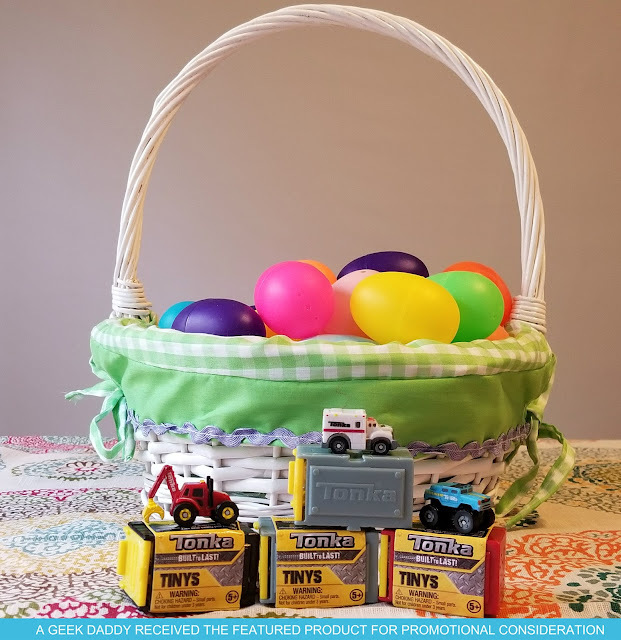 The Tonka TINYS collection of toy vehicles are just the right size to include within an Easter basket and also make for great prizes for a holiday egg hunt. Though small they are "Tonka Tough" and provide a great amount of design detail along with free spinning wheels. Opening mystery packs with collectible toys hidden inside is really popular with my kids. Funrise has taken this blind box approach with Tonka TINYS where kids don't know which vehicle they've gotten until they pull it out of the packaging. I really like the Tonka TINYS blind boxes which mimic industrial shipping containers. These containers can clip together and have a door that swings open and closed that makes them nice to keep around to play with and use as garages instead of just tossing the packaging in the trash. 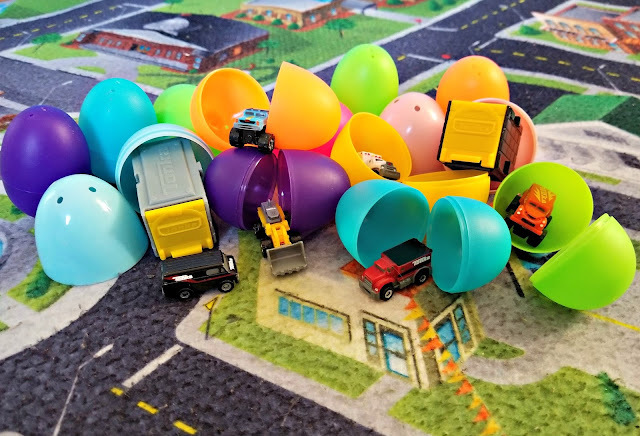 Ambulances, bulldozers, tow trucks and more ... because these toys focus on vehicles used in jobs they really are great for stimulating imaginative play. My favorite from my kids' collection though is a black van that looks like it would be great for reenacting scenes from the A-Team. One of my favorite TV shows when I was my kids age. My twins though have been having a lot of fun pretending to operate construction sites and save the day at disaster scenes with their Tonka TINYS. In addition to the miniature vehicles, Funrise also has created some playsets to use along with their Tonka TINYS. 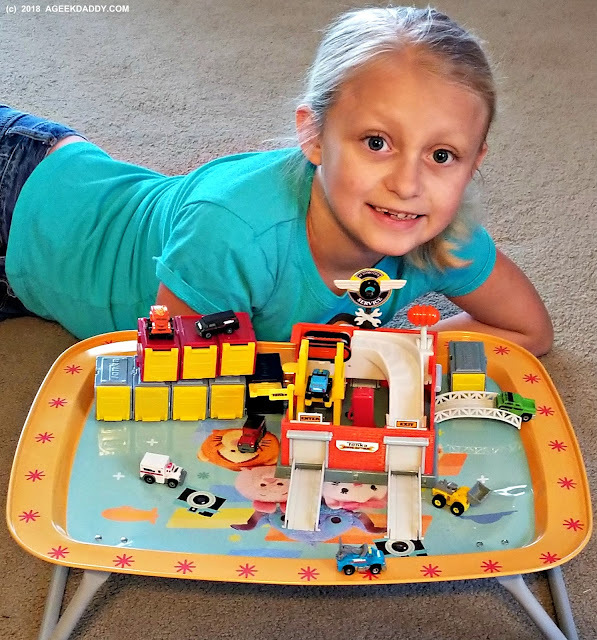 These include a Blast & Dash Quarry, Car Crush Escape Playset, and Rescue Response Station. The playsets attach to one another to expand upon their playability and incorporate some nifty interactive features. For example, the TUNE-UP GARAGE PLAYSET includes a working conveyor belt that when activated by a pull lever will launch vehicles down a ramp. It also has a hand-operated vehicle lift as well as entrance and exit doors that pull open and closed. A classic automotive service sign and gas pump are additional details that add to the garage theme of the playset.